New York Times best-selling author Veronica Roth's much-anticipated second book of the dystopian Divergent series is another intoxicating thrill ride of a story, rich with hallmark twists, heartbreaks, romance, and powerful insights about human nature. Insurgent picks up right where Divergent left off and provides more insight into the factions and the dystopian society in which they exist. This time around Amity and Erudite are revealed in more detail and I found that to be the better part of the book. Each faction has a unique flavor and viewpoint of the overall society and the relationship between them all keeps things interesting. I can't say the same for the relationship between Tris and Four. Their back and forth relationship is just not that interesting and Tris herself is a far weaker character this time around. Her constant self-doubt becomes tiring and Roth could have cut out a good 30+ minutes of repetition and it wouldn't really have changed the fundamental story at all. This book sets up and delivers a big reveal at the end that points to a finale that will likely be very different from where the series started. That could either be a good thing or cause the series to "jump the shark." Based on the reviews I see for book 3, and from what I have heard from my friends, the latter seems to be the case. So pick this one up at your own risk; it is a solid story but not quite as good as book one. The biggest downside to book two is that it leaves you facing a tough call when it comes to book three. For myself, I will listen to Allegiant at some point but I'm not enthusiastic enough about it to do so right now. I really enjoyed the first book. I found the Factions the Initiations and the beginning of the war very engrossing. I was OK with the teen relationship and I found Tris to be mostly relatable and found her strength and fearlessness to be engaging. In this book, having made it only halfway through, I want to tell her to get over it all. Her guilt, her self-doubt, her lack of self-esteem...she seems to go on and on. And I find it difficult to determine whether Tris is talking or thinking to herself due to the narration. Disappointed …. Now to find a grown-up book! 58 sur 67 personne(s) ont trouvé cet avis utile. Stellar... seriously... have you read this yet? In full disclosure, I’ll start off by saying that I love Divergent. I love Tris. I love Four. In my review of Divergent I raised some things that didn’t sit right with me—but, having listened to Insurgent all of my questions/issues were addressed. And while, I can’t change my initial reaction to Divergent---Insurgent has made me love it more and in our trilogy-centric YA world I think that’s a major feat. That being said, I am still reeling a bit by the reveal at the end and if I struggle to find the words I hope you will forgive. The story picks up literally where we left Tris and gang---and follows them through several different areas. This really helped to flush out the world even more. I loved being able to see the inner workings of different factions. I do not want to give away anything but let’s just say (while I consider myself a truthful person) I do not want to EVER live in Candor. Tris is much more vulnerable now... deeply affected by losing her parents and wading through the guilt of Will. This story is painful and contains twists and turns that I did not anticipate… betrayal and assistance where I didn’t expect it. And that end… I'm going to start listen to them both again and again... I know it. Tris and Four… uh! Thank you Veronica Roth… for creating this relationship. Thank you for NOT (can you believe it) giving us a triangle. Thank you for your amazing and realistic dialogue. I… I really am at a loss for words to describe how satisfied I am. And anxious too. I am in awe of Emma Galvin’s talent. The emotions she brings only enhance the super intense moments. I think her performance was amazingly spot-on. 80 sur 95 personne(s) ont trouvé cet avis utile. This is just plain, good story telling. There's a little less gushy teen hand-holding and lovey-dovey stuff in this, the second book. Which made me happy. I would have been even happier if this had been released, not as a trilogy, but as one long book. But I guess trilogies are all the rage these days. I can't believe the author is just 23. There's talent there. Hey, Veronica, finish the third book soon, please. Your closeted 50-year-old white male fan is waiting. 59 sur 70 personne(s) ont trouvé cet avis utile. What disappointed you about Insurgent? I'm not sure why the author tried so hard to make Tris so wishy washy and create exaggerated drama. I bought this book in order to see where she would go with the story and I found out it was a teenage angst melodrama. Much of the book seems to be a stream of conscious which is confusing to know when Tris is speaking versus carrying a conversation in her own head. I'll finish the book but avoid the third installment. Would you ever listen to anything by Veronica Roth again? Doubtful. the writing leaves me lacking for more. What three words best describe Emma Galvin’s performance? 24 sur 29 personne(s) ont trouvé cet avis utile. First of all I must declare that I did indeed enjoy the story line presented by Divergent and immediately carried forward by Insurgent. After listening to the first two books of this trilogy however, I'll find it hard to spend the the time to listen to the third book in the series. Tris and Four are great characters in a very engrossing story set in an imaginative world. A story with plenty of action, relationships, and intrigue to carry the listener into their adventures. However, these books are written for young adults. I found there was much too much gushy adolescent adoration / love and meaningless conflict and confrontations between characters to my liking. The book was rife with Tris's self reflection and insecurities. The story seemed to have been constructed with a great story line but once the story was complete insertions of self reflection, insecurity, and gushy love text were inserted into scenes to extend the story. I would compare it to a poor editing job on a movie where you may have seen a filler street scene once before in the movie. This may be the fault of an inexperienced author or advisement by her editors. It got to the point where I would fast forward over much of Tris's narrative. The words began to feel too sappy. How many times do we have to hear about Four's blue eyes or regret over Will? I'm sorry to say if you are looking for a series to provide you with a "Hunger Games"-like fix you probably won't find it with these books. Insurgent and Divergent, have the hallmark of romance novels for YAs (minus any lurid love scenes) with a sci-fi twist. There's a great story but it becomes mired in too much sappy self reflection, insecurity, and gushy love. On the run and searching for answers, Tris and Tobias explore other factions in this dull, formulaic sequel. The movie was well done, suspenseful, casting was spot-on perfect, and the director took the time to introduce and explore the characters' personalities. Against my better judgment, I downloaded book two to keep the story going. Since I didn't love book one, don't know why I thought book two would be better (although Emma Galvin is excellent).Don't spend your credit, wait the 11 months for the next film. 20 sur 25 personne(s) ont trouvé cet avis utile. I seem to be in the minority.... but I didn't enjoy this one nearly as much as Divergent. Maybe my expectations were too high. I found my mind wandering a lot instead of really being engaged. I felt like Tris was bouncing around from one faction to another and, instead of uncovering some of the details of the factions and world building, it felt confusing and disjointed. I also was baffled by the reactions of all the factions in light of what happened at the end of Divergent. As a reader I suppose I just accept it and move on but I found the decisions to be distracting and frustrating. On a pickier note, there are a lot of side stories going on with characters we are supposed to remember... but I didn't. I'll admit that I'm pretty bad with names but typically authors give us some clues as to who these people are. They didn't leave enough of an impact in Divergent for me to remember all of their names. The beginning of the book was very confusing for me because I could not remember who these people were. I had to go back to Divergent because there were no contextual clues at all. I listened to "Divergent" by Veronica Roth some time last year around the time that I listened to "The Hunger Games". 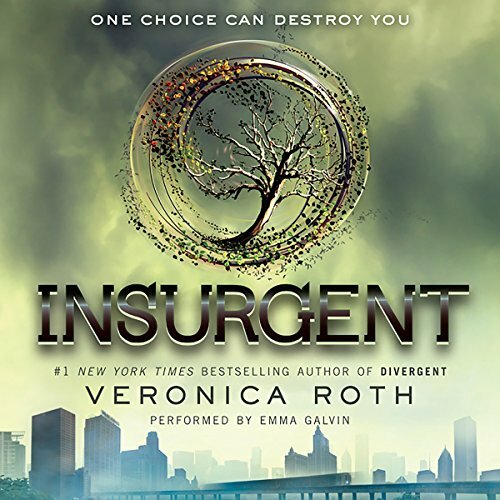 I delayed listening to this second book in the series, "Insurgent", for the mere reason that I found out that the book had not been released as yet and I simply didn't want to blow throw these books and be on that consistent waiting list for the other book to come out. Finally the third book in the series is set to release (I have already pre-ordered the book) and I just blew through this book! And this was absolutely worth my wait! The story kept you engaged and produced a twist in the end that not even me (the most ardent book reader) could have seen coming! The characters are varied and interesting. The story itself isn't too censored but still definitely suited for a teenager. I recall thinking that the story was pretty fast paced at times, but it suited a book like this. The narration was well and really did describe the feeling of the leading female character. You can practically hear the desperation in her voice at certain points in the story. Overall I enjoyed this title immensely and can't wait for the third book in this series to be released! Where does Insurgent rank among all the audiobooks you’ve listened to so far? One of the best, all three of these books were great. What other book might you compare Insurgent to and why? Maze runner, the intensity and kept my attention. I couldn't stop listening. Insurgent konnte gar nicht so gut werden wie Divergent. Das sind zweite Bände einer Trilogie niemals. Divergent hat eine dystopische Welt aufgebaut, die wirklich anders ist als alles, was ich bisher auf diesem Gebiet gelesen habe. Insurgent baut darauf auf und muss die Geschichte nun weiterführen, aber noch Raum für einen dritten Band lassen. Das ist insgesamt gut gelungen. Tris und Tobias müssen sich nun entscheiden, wo ihre Loyalität liegt. Wollen Sie Teil der 'Factionless' werden und versuchen, von dort aus die Herrschaft von Erudite über die anderen 'Factions' zu brechen oder wollen sie das tieferliegende Geheimnis erkunden, das die Abnegation so lange zu verstecken suchten. Diese Frage stellt die Beziehung von Tobias Tris auf eine Zerreißprobe, da beide unterschiedliche Antworten auf die Frage haben. Die Beziehung zwischen Tris und Tobias wird spannend weitergeführt, und ist ein Lichtblick in der doch recht dunklen Geschichte. Tris' Drang, sich immer wieder selbst zu opfern, erscheint zwar manchmal ein wenig unverständlich, aber insgesamt sind selbstlose Helden ja ein bekanntes literarisches Mittel, das auch bei Harry Potter schon gut funktioniert hat. Das Buch endet mit einen 'Bang', einer Offenbarung, die alles verändert. Das ist definitiv gut gelungen, auch wenn nicht alle Wege dorthin immer ganz logisch erscheinen. Es ist klar, dass sich die dystopische Welt nun etwas öffnen wird und Tris und Tobias vor weiteren spannenden Herausforderungen stehen. Fazit: Ein guter zweiter Band, der auf mehr hoffen lässt. The mixture of action and emotion is fantastic. Veronica Roth truly is a genius writer, and her work couldn't have been in better hands, than the ones of Emma Galvin. This audio book is relatively easy to understand, if you are not natively speaking English and I advise to listen to this unabridged, English version, instead of a translation. Super spannend und phantastische Sprecherin! Schade, dass nur noch ein Buch gibt. Ich könnte ewig weiterhören. Vor allem die Sprecherin ist wirklich herausragend. sie liest die Charaktere sehr individuell, so dass man leicht folgen kann und stets weiß, wer spricht. Nur zu empfehlen!